Benzaco’s waterless ODOR-ARMOR™ VPS formulations are used in a wide range of custom engineered vapor generating modules that can be used year round. Sub-micron sized odor control vapor is blown into rooms, air handling systems or through lengths of perforated HDPE welded pipe where it is diffused through equally-spaced holes. VAPOR-PHASE™ odor control does not require water or nozzles and can be used in cold weather applications. The ultra small odor control vapor droplets provide increased opportunity for collision with nuisance odor compounds where a series of chemical reactions neutralize the odor in the air column surrounding the diffuser pipe. Benzaco VAPOR-PHASE control modules are built to last using premium weather resistant materials and suitable for indoor or outdoor applications. 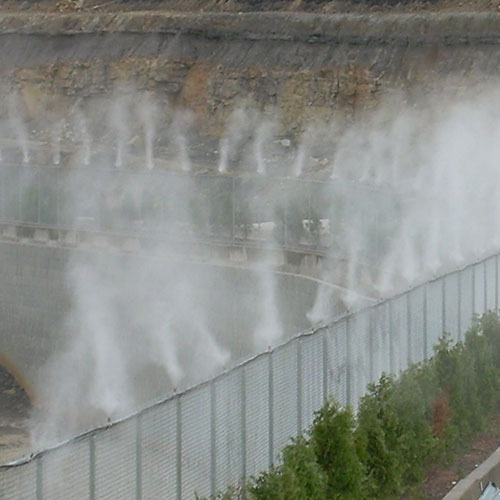 A patent-pending process is used to produce a uniform and consistent release of VAPOR-PHASE odor control solution as sub-micron vapor droplets. Systems are available in many sizes with blowers to support 100 to 2000 feet of diffuser pipe. PLC programming , automated dosing and the use of VAPOR-PHASE waterless formulations ensure uninterrupted treatment for up to several months between service. They are custom built as stationary platforms, that are available in weather resistant enclosures, and portable trailers. Each system is custom designed to achieve individual operational objectives and can be equipped with a range of accessories to enhance management and site specific service characteristics. VAPOR-PHASE applications are ideal in year round environments, locations with water restrictions or where conventional atomizing nozzles may be positioned in areas not easily serviced.